3 cups vegetable or chicken stock (not broth) Low sodium ideally. 1. In large pot, on lowest heat setting possible on your stove, melt your oil and then add your onions and garlic with a few dashes of salt to start extracting the moisture from them. Place lid on top of your pot and start to sweat the onions with the garlic. (Sweating means you are cooking on a low heat allowing the juices to slowly come out with out causing any burning or browning.) Stir occasionally. 2. As onions start to get somewhat softer, add in your mushrooms, celery and carrots along with a few more dashes of salt. Make sure the heat is still on lowest setting possible. You will continue to slowly cook down the veggies and start caramelizing them on lowest heat setting. This will take patience but very worth the end flavor. 3. Once onions become a light brown and are nicely translucent, add in your wine and cook until all comes to a gentle simmer. 4. Add in your stock and potatoes. Bring back to a gentle simmer on a low heat setting. 6. At this point taste your soup, add in additional salt to your taste and then the pepper and a couple dashes of nutmeg. Do not add too much nutmeg though. 7. Simmer your soup on low heat for another 20-30 minutes to allow the flavors to meld together and cook down the water. Make sure to stir every 5-7 minutes and scrape down the pot's sides with your spatula. The soup will start to thicken at this point thanks to the potatoes, which now have made your soup "creamy." 8. You can serve as is, or add in things like bits of cooked grilled chicken, or sliced sweet Italian sausage for a little more of a hearty meal and protein. Or to keep it Vegetarian, a wild rice would be a great addition. Super Simple Crochet Afghan Pattern, Free from VSM Handcrafted Designs! In this house we all love to curl up under oversized and super comfy blankets as the weather gets colder. While I do have lots of large afghans, they aren't as fluffy and warm as they used to be after years of use. 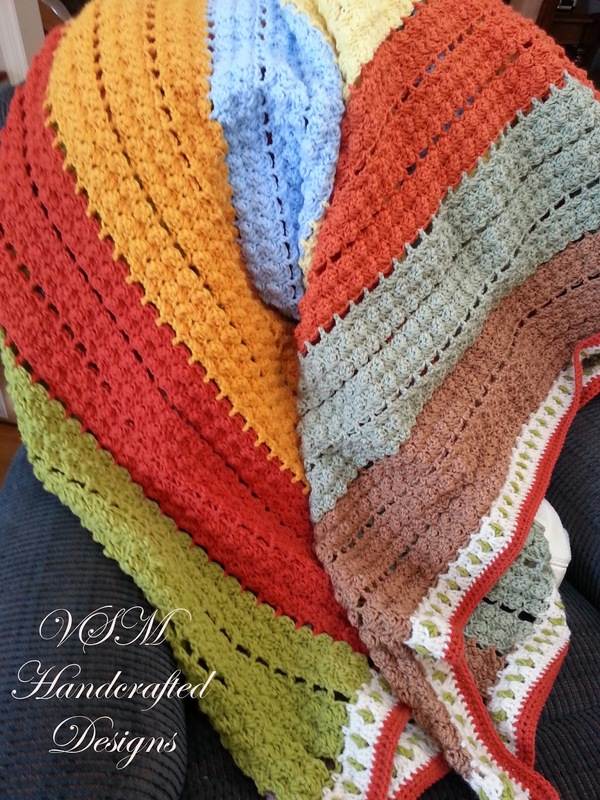 I figured it was time to make up a new one for the house and I wanted this one to be bright and cheerful for those more dreary and dull winter months. It's actually a very easy pattern once you get the hang of it. 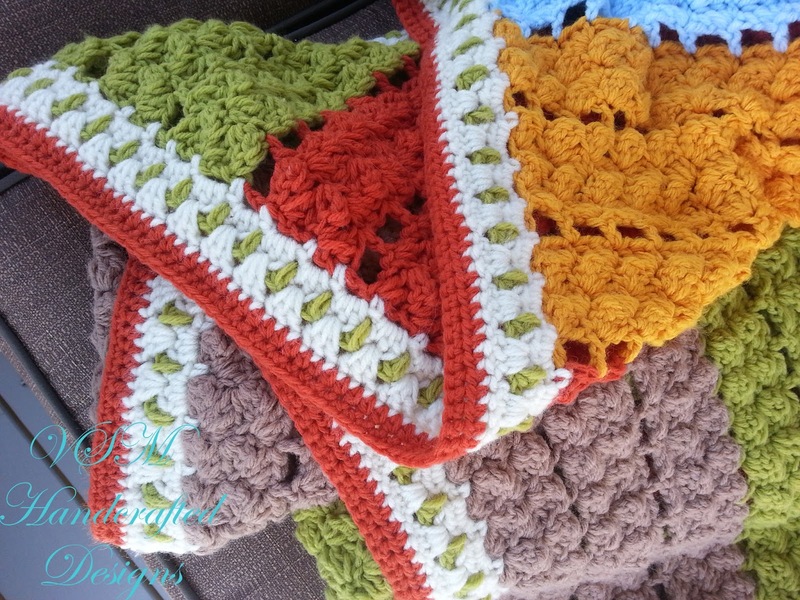 Because of this, I decided to offer it up as a free pattern here on the blog. Now, a little request. Even though this is free, I did put a lot of time into writing it up and creating this design. So please, be respectful of this and do NOT reproduce this pattern for sale or use any of the photos in this blog as your own. While more than welcome to sell any products you create from this pattern, you cannot sell this pattern itself. It is mine, and I ask that you do credit the shop's name if you share it with others. The stitch used in the body of the afghan works off a count of 3. So decide how long you'd like your afghan to be and then you can do a gauge swatch to see how many stitches per inch you will get. Once you do that, you can determine how many sets of 3 you would need to meet your desired length. You may use any size hook or yarn in this case. I went with a 4 ply worsted weight yarn and an I hook. Basic Instructions for stitch pattern in the body. 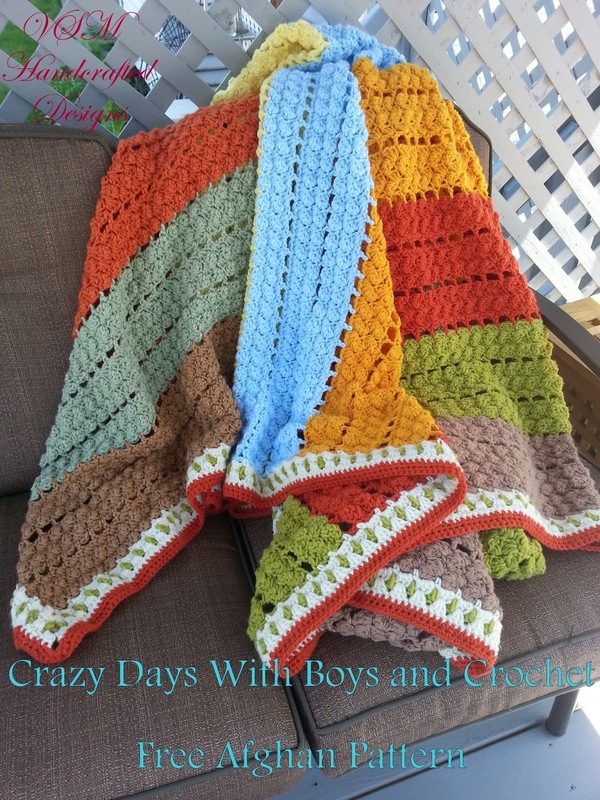 This pattern will be challenging at first for someone just getting started with crochet but with the repetition of the stitch it will get easier. Anyone else intermediate and above should do fine with this, and if you have a question, just contact me. R1- In 3rd ch from hook 2 dc. *Sk next 2 ch then sc in next ch. In same ch, 2 dc. * This will create your cluster. Continue * to * to very end of the length of your starting ch until you get to the last 3 chs. Sk 2 chs and sc in last ch. Ch2 and turn. R2- In 1st sc, 2dc. *Sk next 2 dc. Sc then 2dc in next sc. * Rep * to * and end the row with a sc in last st of the row. Ch 2 and turn. 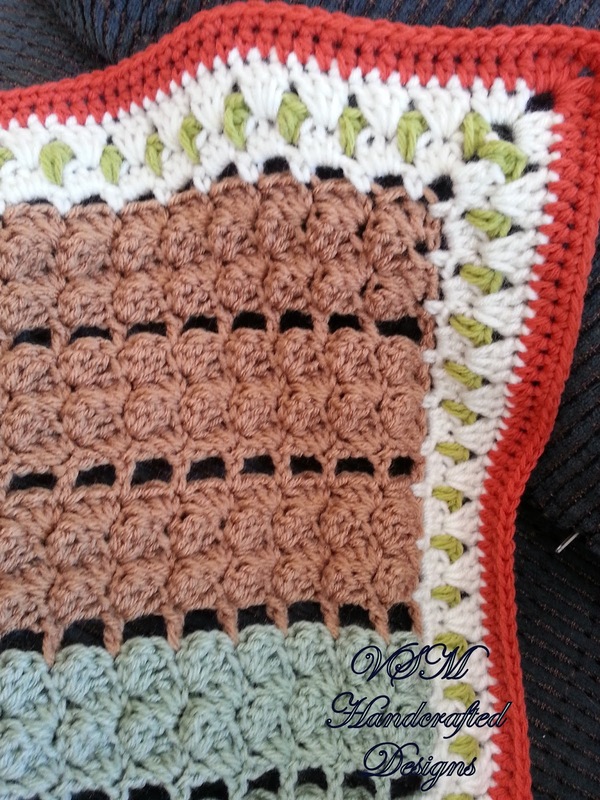 I went with doing a grouping of 4 rows of this stitch style with an alternating row of the following instructions. You can of course alter to fit your preferences. Alternate Row- Make sure end of last row has a ch5 instead of ch2. Sk 1st sc and next 2 dc. *In next sc, dc, then ch 2. Sk next 2 dc. * Rep * to * and finish row with one last dc in the last st of the row. Ch2 and turn. To continue with cluster pattern, just sc, 2 dc in all the previous dc from the alternate row and end with a sc in the last dc of that row. You can then pick up with instructions to R2. Continue with this format until you have your desired width to your length. If you are going to switch colors, do so on an Alternate row for best results and consistency. The wonderful thing about this pattern is that you can just leave it as it is or you can opt to create a border like I have with mine. To create this particular border you will need to be advanced with crochet. R1- You will be working in the round for this. In corner of last sc with starting border color, ch 4. Work along your last row of the body and ch2, sc in the next sc from prev row. In the last st of this row you will need to sc, ch3, sc in same st. Now you will rotate your work to continue along a new edge. You will need to evenly work the same ch2, sc across this edge. If you do the 4 rows with an alternate combination, I found working a sc at either edge of the dc sp, and a sc in between the 2nd and 3rd rows the easiest way to space. If you have altered this count, you may need to fiddle with your spacing. 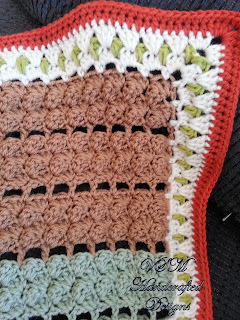 When you get to the next corner, again be sure that the corner stitch will get a sc, ch3. sc. Again rotate and move on to your next edge and evenly work the ch2, sc combination down that edge. Corner will be sc, ch3, sc and finish off your final edge evenly spacing the ch2 sc and finish with a sc, ch3 and connect with a sl st to the 2nd ch of the original ch4. Ch1. R2- Using same color, 3hdc in 1st ch2 sp. Continue to work 3 hdc in the ch2 sps. When you reach a corner, 3hdc, ch3, 3hdc. Pick back up with the 3hdc in ch2 sp and continue around all edges. When you get back to where you started connect w sl st to 1st hdc. Do not fasten off current color but do cast on your new accent color. R3- With new color and starting in the corner of just behind where you connected w. a sl st, Ch3 and dc around the ch3 sp. Ch 2. Sk the next 3 hdc, and in sp between the prev 3hdc and the next 3 hd, make a cluster st of 2dc. (2dc cl- This means you will need to yo, insert hook into sp, yo and pull through to have 3 loops on the hook. Yo and pull through 1st 2 loops. Then yo again, insert hook into sp, yo and pull through to have 4 loops on the hook. Yo, pull through 2 loops. Yo and pull through remaining loops) Continue to ch 2 and 2dc cl in the sps between the 3hdc groups. In the corners 2dc cl, ch3, 2dc cl. In last corner you will do 2dc cl, ch3 and then connect with a sl st to the 3rd ch of the original ch3 in this round. Fasten off this color and get ready to go back to your original border color. R4- Working behind your last sl st in the corner, ch3, 2 hdc. Then dropping your stitches down to R2, 3dc in the middle hdc. Continue to do this along the edges, making 3 dc in the middle hdcs of R2. When you reach the corners 3hdc, ch 3, 3hdc. Continue working around your edge like this and at the end you will need to do 3hdc, ch 3 and connect w a sl st to the 3rd ch of the ch3. 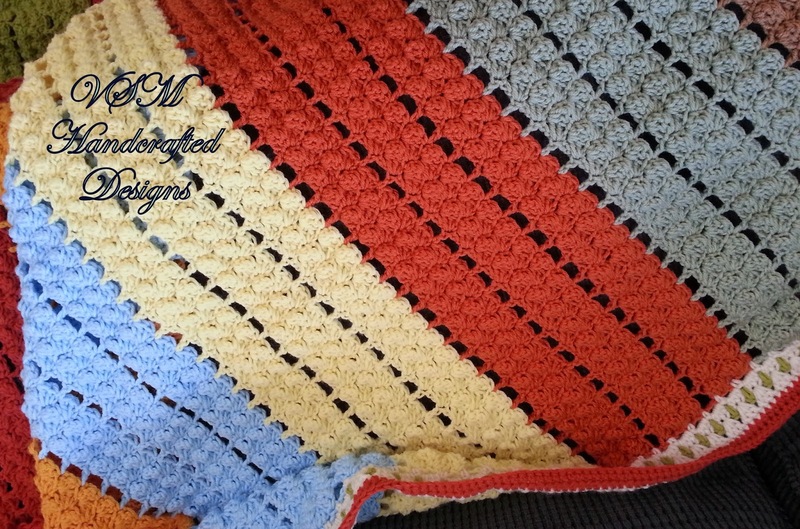 Fasten off this color and cast on your next border edge color. R5- Working behind your last sl st in the corner, ch3, 2hdc. Continue with a hdc in each previous st from R4. When you get to the corners 3 hdc, ch1, 3hdc. Again continue with this around your edges. At last corner 3hdc, ch1 and then connect with a sl st to the 3rd ch of the ch3. Ch 1. R6- In same st as sl st, sc. Sc in each hdc from R5. At the corner ch1 sp, 3 sc, the continue with sc in each of the prev sts. Connect with a sl st when you get back to the starting sc. Fasten off and weave in your ends. 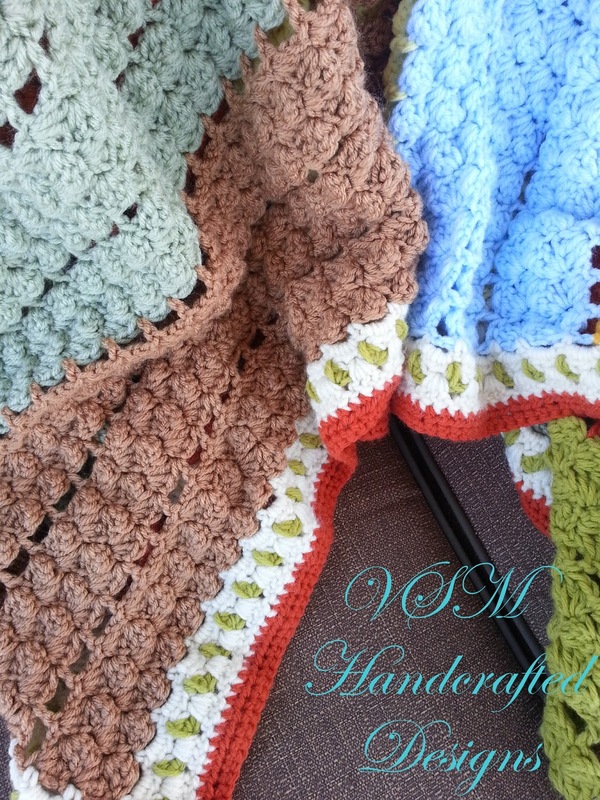 I hope you enjoy working on your own afghan and I'm always up to see what others create from my patterns. Feel free to send me a picture of what you have completed!